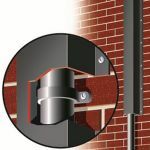 Anti Climb Spiked Pole Collars (also known as anti climb brackets, spiked collars or anti climb pole collars), offer a simple and practical solution to protecting poles (and pole mounted equipment) against vandals, thieves and general troublemakers. 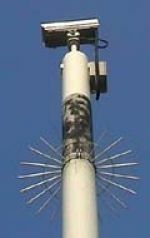 Posts and poles are often used to mount valuable items, such as cameras or security lighting, that would present risk of theft or vandalism. 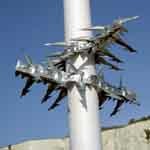 And poles may even provide a potential access point onto your property or temp showoff climbers. It therefore makes sense to discourage and prevent people from climbing your posts and poles. Anti climb brackets and collars provide highly effective visual deterrence and formidable barriers which are not easily overcome. For maximum security, these units can be used in conjunction with anti climb paint, otherwise known as anti intruder paint or non-drying paint. This custom built anti climb collar is a visual and practical deterrent to climbers. For maximum protection the pole for the 1 metre immediately above the collar has also been painted with anti climb paint. Anti climb brackets are available for round or square poles. Corner anti climb brackets are ideal for towers, buildings, etc. Our bespoke range of anti climb collars can be manufactured to any size as required and are ideal for protecting pole mounted CCTV cameras, security lighting and lots more. Naturally, some sizes are more popular than others, however Insight Security now offer a comprehensive range of sizes for both round poles and square posts, with most sizes being typically available from stock. Spiked Collars and Anti-climb Brackets are manufactured from welded steel components and galvanised for protection against the elements. If required these be overpainted in any standard RAL colour with a durable baked on powder coat paint finish. Talk to us about your specific requirements. Anti-climb collars and brackets offer both a visual and practical physical deterrent against would be climbers. Should you require a size not immediately available from stock, our manufacturing lead-time is typically circa 2 weeks . This `instant` low cost anti climb collar protects against climbers and can be used in conjunction with anti climb paint for added protection. Fabricated from our Razor Spike anti climb barrier, these collars offer a practical, instant and low cost alternative to custom designed collars. For maximum protection, two instant collars can be installed at right angles to each other. The dual rows of straight and barbed spikes offer an effective physical and also a very visual barrier to climbers. This custom built spiked barrier is both a visual and physical deterrent to intruders. For maximum protection spiked collars are often used in conjunction with anti climb paint. Manufactured to order, our spiked anti climb and anti intruder barriers are of welded steel construction, with a galvanised weather protected finish. Available in any size, custom built collars are in use throughout the UK.